You might recall TW's mistake in remembering last week's Saturday PhotoHunt theme. This week I took over cos she was already telling my furrends on the CB that the theme was Gobel; as in George Gobel. I googled him and apparently he does exist; or at least he used to. You can see the odds I'm up against. They're not good at all. This week's theme is Global. 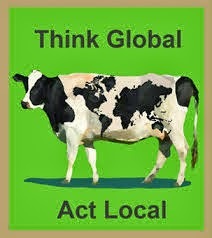 I like the phrase that TW told me about: Think Global, Act Local. She'd first heard it back in the '80s—before there were computers or electricity—when she was touring in a horse and buggy with R.E.M. and Greenpeace had a booth on the tour. TW swore she had a t-shirt with the slogan that I could pose with but again, her memory was faulty. She dug up one with a globe but I gave her the back/derriere of disrespect. The slogan was originally meant to refer to the environment and recycling but to me it's all about anipal rescue. Think/tweet about all the global rescue organizations and donate/volunteer with some local ones. I'm all about sharing so that's what we do. 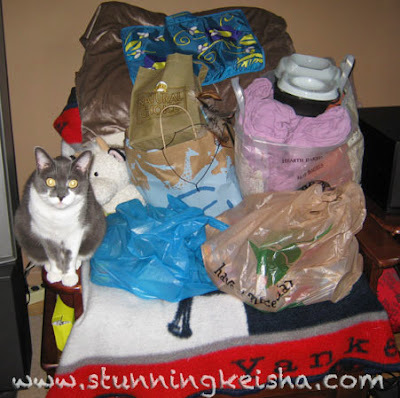 Here's a photo of me posing with some stuff that we donated to A Call 4 Paws (cat and cow not included). What a haul for them! If any of you are local to Jonestown, PA, you might want to volunteer to feed and look after the 50 cats at their Sanctuary. Volunteers seem to be in short supply. Her contact info is on their newly revamped and pretty pawsome website and Facebook page. 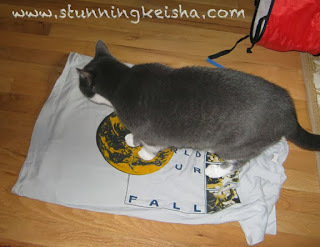 CK, even your human had a better idea than mine did for this week's Photo Hunt! I had to tell her to go take a hike with her lousy idea. Nice one Keisha. Have a super Saturday. The human thought it said … act loco at first …. which she is and does! Anyway, good idea. She says eating low cal stops you having hefty hips or something! I love that CK and I keep telling my Dad that thinking at all is a good thing! This was a challenging Photohunt theme and we really like what you came up with - it's a fantastic slogan and very wise advice! CK what a pawsome idea. YOU hit it outta the park on this one and lots of kitties will get some great stuff! What a great way to recycle the saying. That's a really generous donation to A Call 4 Paws! Yay, that's a fab win win for cats and the planet! Wow, CK! A Call 4 Paws is gonna really appreciate all that stuff! Good job!! Way to go, CK. That's really going to help A Call of Paws so, so much! and a VERY pawsome donation for your furiends at A Call 4 Paws! Wow--what a great donation! Those kitties will be soooo happies! But say, you're not SO disenchanted with your Boys of Summer that you're giving their BLANKET away, are you??? Your Mom must be totally as cool as Sparkle's Mom. They are hard-core rocker chicks. My Human was only ever a wannabe, ha ha meow! That is a great thing you are doing. If everyone helped their local rescue groups, the world would be a better place. Excellent advice! woo woo woo!!! So why was your touring with REM? Brilliant message, Keisha! Love it. Wow, you got lots of loot to donate for sure! That's awesome, CK!